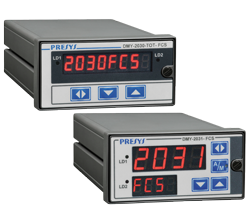 Models for 12 TCs, 8 RTDs, 12 current (4-20mA) or 12 voltage (1-5Vdc) inputs and combinations of two input types. Totalization of eight voltage or current inputs. Up to two SPDT relay alarm modules and RS-232 or RS-422/485 communication. Ideal for use with the Virtual Recorder VR-2000. One universal input for RTD, TCs, 0-55mV, 4-20mA, 1-5Vdc, 0-10Vdc. Analog output module for 4-20mA, 1-5Vdc, 0-10Vdc. One frequency signal input up to 30kHz. 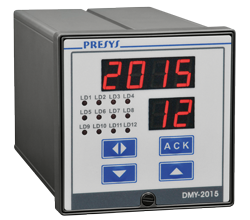 DMY-2030: Two universal inputs for RTD, TCs, 0-55mV, 4-20mA, 1-5Vdc, 0-10Vdc. 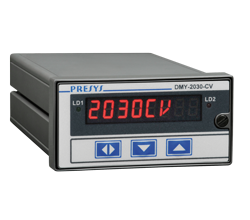 DMY-2030-F: Two frequency signal inputs up to 30kHz. Up to two analog output modules of 4-20mA, 1-5Vdc, 0-10Vdc. 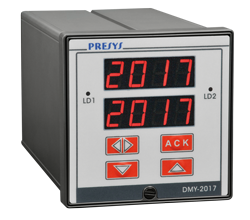 Up to four SPDT and SPST relay alarm modules. 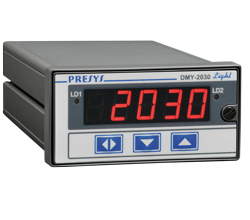 DMY-2030-TOT-Light: One universal input for 0-55mV, 4-20mA, 1-5Vdc, 0-10Vdc. DMY-2030-TOT-F-Light: One frequency signal input up to 30kHz. Totalization of the input signal. 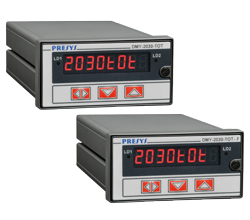 DMY-2030-TOT: Two universal inputs for 0-55mV, 4-20mA, 1-5Vdc, 0-10Vdc. DMY-2030-TOT-F: Two frequency signal inputs up to 30kHz. Totalization of the input signals. Two pulse inputs up to 500 Hz. 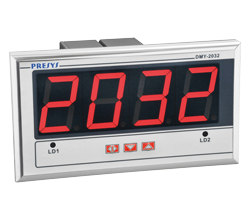 4-digit large displays (57 mm) for visualization up to 20 m.
DMY-2032: Two universal inputs for RTD, TCs, 0-55mV, 4-20mA, 1-5Vdc, 0-10Vdc. 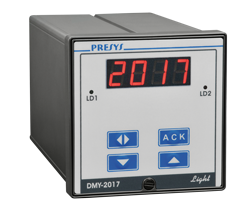 DMY-2032-F: Two frequency signal inputs up to 30kHz. 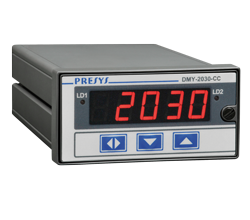 One -30 mV to 30 mV input for load cell. Indication with peak hold, minimum and maximum values. 10Vdc/100mA power supply for load cell. 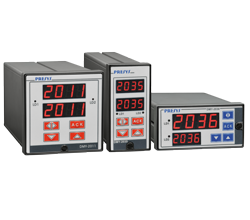 Three 4-20mA and 1-5Vdc standard inputs for flow, temperature, and pressure signals. Calculation of flow rate with/without temperature and/or pressure correction, with/without squared root extraction. Totalization of the corrected flow and preset. Linearization of the flow signal with up to 21 points. One pressure input for gases and liquids. Ranges from 10”H₂O to 5000 psi (gage or absolute pressure, including vacuum). Two pressure inputs for gases and liquids.